Can you swim?? Do you like alligators?? Does hypothermia bother you?? Maybe you better read this section....?? 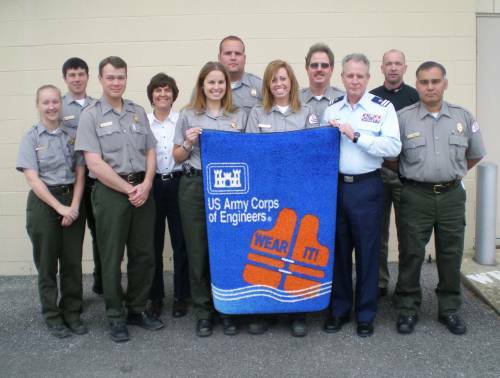 This year as in years past the Water Safety Task Force is hard at work bringing awareness of boating safety to the public. Left to right: Lindsey Houchens-J. Percy Priest Hickory Lake, Tyler Matthews-Center Hill Lake, Charlie Leath-Cheatham Lake, Carolyn Bauer-Coordinator, Nashville District Water Safety Task Force, Crystal Tingle-Old Hickory Lake, Kyle Lock-Martins Fork Lake, Sarah Bates-Lake Cumberland, Mark Vaughan-J. Percy Priest Lake, Randy Hawkins-US Coast Guard Auxiliary Div. 11 Flotilla 11-02 , Dave Bishop-Nashville District Chief of Safety, Rich Rice-Lake Barkley. Safety is enhanced by proper communications. Read the following over before you depart on your next big adventure, and keep a copy aboard if possible. The phonetic alphabet may be used to identify any letter of the Alphabet, or to spell a word or group of letters. To distinguish numerals from words having the same meaning, the PROWORD "Figures" is used preceding such numbers. Note: A hyphen represents a pause. Procedure words (prowords) are words and phrases used to speed the transmission of radiotelephone messages. The table shown below contains a list of prowords together with an explanation of each. WRONG	 Your last transmission was incorrect " the correct version is a...". Spelling Difficult words or groups within the text of plain text messages should be spelled using the phonetic alphabet preceded by the PROWORD "I SPELL." If you can pronounce the word to be spelled, do so before and after the spelling to identify the word.
! !Say It - Spell It - Say It Again!! "CANTENARY - I SPELL-CHARLIE ALFA NOVEMBER TANGO ECHO NOVEMBER ALFA ROMEO YANKEE - CANTENARY". Say It - Spell It - Say It Again; If the word sounds the same but has a different meaning. Ex. To, Too, Two. Coded Groups If a message text contains coded groups or other words that cannot be pronounced, the phonetic equivalents of the individual letters should be transmitted, without the PROWORD I SPELL. LOZWT in text "LIMA OSCAR ZULU WHISKEY TANGO"
12A9B Spoken "FIGURES - ONE TWO ALFA NINER BRAVO"
TS67R Spoken "I SPELL - TANGO SIERRA SIX SEVEN ROMEO"
Abbreviations Abbreviations in the text, initials used alone or in conjunction with short titles shall be spoken phonetically. A. Spoken as "ALFA PERIOD" or ACP spoken as "I SPELL - ALFA CHARLIE PAPA". Abbreviations frequently used in normal speech may be used in the same manner when transmitted by voice. USCGC DALLAS spoken as "UNITED STATES COAST GUARD CUTTER DALLAS - I SPELL - UNIFORM SIERRA CHARLIE GOLF CHARLIE - USCGC DALLAS." 20 AUG spoken as "TOO ZERO AUGUST." Initials Personal initials shall be spoken phonetically, prefixed by the word "INITIALS." W.E. LEWIS spoken as "INITIALS WHISKEY ECHO LEWIS"
Roman Numerals Transmitted as the corresponding Arabic numerals preceded by the word, "ROMAN NUMERALS." Note: Spelling of words lengthens the time of transmission, thus increasing on-air time. Avoid spelling words unnecessarily. Period "PERIOD OR FULL STOP"
Parenthesis " BRACKETS ON/ BRACKETS OFF "
Note: Do not use "Symbol For"
How to Call and Reply Transmitting and receiving on a voice circuit will be accomplished in the following manner. Keep in mind proper circuit discipline. 1 Check your transmitter/receiver settings and verify the proper transmit/receive frequency is dialed in. 2 Listen to the frequency to ensure you will not interfere with another transmission in progress. 3 Speak clearly in a normal tone of voice, holding the microphone no more than an inch from your mouth. 4 Avoid excessive calling and unofficial transmissions. Call signs should be transmitted only once when conditions are favorable and twice when unfavorable. 5 If three attempts to contact a station are unsuccessful, send the PROWORD "Nothing Heard". Attempt to establish communications with another station and request their assistance in contacting the original unit. Continue your call-up at reasonable intervals. 6 Message transmissions should be sent at such a speed as to allow accurate copying of the message. Send phrase by phrase, un-keying the microphone at regular intervals. 65 156.275	 156.275 Port operations for intership and ship to coast. 07 156.350	 156.350 Commercial use for intership and ship to coast. 67 156.375	 Commercial use for intership only. 68 156.425	 156.425 Noncommercial use intership and ship to coast. 24 157.200	 161.800 Public Correspondence ship to coast (Telephone channels). 21A 157.05 157.05 Intra-Coast Guard VHF-FM working frequency for units in maritime mobile operations. 22A 157.100	 157.100 Primary VHF-FM liaison frequency for communications between Coast Guard units and civilian stations. It is also used for making Coast Guard Marine Information and Marine Assistance Request Broadcasts (MARBs). 23A 157.15 157.15 Intra-Coast Guard VHF-FM working frequency used for communications between Coast Guard units working in maritime mobile operations. 81A 157.075 157.075	 Intra-Coast Guard VHF-FM working frequency for units in maritime mobile operations. 83A 157.175	 157.175 Intra-Coast Guard VHF-FM working frequency for units in maritime mobile operations. 2182 International distress and calling frequency used world-wide for distress calls and for urgent message traffic. Also, ship and shore stations may use it to establish initial contact, then shift to a proper working frequency for passing operational traffic. All units must maintain radio silence on this frequency for three minutes, twice each hour, except for transmitting distress, or urgency messages, or vital navigation warnings. 2670	 Coast Guard working frequency used to broadcast urgent safety messages; precede messages on 2670 kHz with a preliminary announcement on 2182 kHz. Primary MF/HF Coast Guard/civilian liaison frequency. 2738	 International intership safety frequency. Coast Guard and Auxiliary boats may use this frequency to communicate with other vessels in all areas, except the Great Lakes and Gulf of Mexico. 5680 International SAR on-scene frequencies. Use either and	of these frequencies to conduct communications at the scene of an emergency or as the SAR control frequency. The links below are a few of many thousands that contain essential Boating Safety information. Safe Boating Kidsite Central ..... Fun & Education! Boat Safe Kids Questions! ..... More Fun & Education!